'Hero Utkarsh Plots' a plotted community positioned in the land of the Gods (Haridwar). With the echo of the divine, a feel of blessed, an experience of paradise, the aroma of nature, the feel of never-ending, could any person desire more? Located at Roshnabad, Haridwar nearby Jawahar Navodya Vidyalaya, this secure gated community is a part of Haridwar Greens, discreetly located within wide acres of green land. At here, Hero Realty Pvt. LTD. engages all six senses to get a wonder living experience that is heavenly and absolute. This developer knows that it’s not just a piece of land, but something more that completes the experience. For this, they have an array of amenities that give you the entire experience of living in luxury. These residential plots in Haridwar are like a blank paper where you can create your own home according to your creativity or needs, very much away from the metropolitan jams, pollution, and scarcity of space, amidst space which breathes. 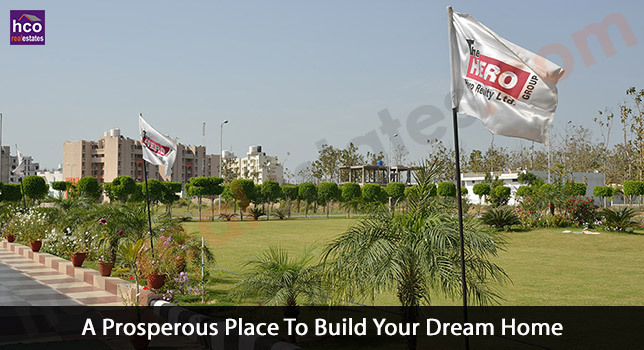 Owning Hero Utkarsh Plot will offer all that you dreamt about for your future abode, in different ways. Merging soothes with groundbreaking superiority in design and detail, this completely planned Township from Hero Group is truly your dream home in Uttrakhand. Sustainable, eco-friendly planning, best energy efficiency, technique of tomorrow, space that will offer an improved living environment, all arrange a property for age group, ready for the future. Look outside from this community and you will find yourself inspired by the greenery everywhere, picturesque views of the hills, river Ganges and best location of Haridwar that take into consideration your sharp taste and your love for peaceful living. This developer leave no stone unturned to make your living environment perfect to the detail. At Hero Utkarsh Plots Haridwar - every home are available with a host of amenities to develop your standard of living. An exclusive feeling of living in culturally rich locality, the well maintained streets & common areas, noise & pollution free environment will add extra stars in your reputation.